C-GLCT at Biggin Hill - EGKB, United Kingdom. C-GLCT at Prestwick - EGPK, Scotland, ready for the crossing. • G310 Ghana Air Force. Delivered 25-Jul-1962. Based at Takoradi Air Base. Note: The following registration CF-ZFO was allotted to Lambair Ltd., The Pas, MB. on 21-Apr-1971 who were considering a deal to purchase seven of the Ghanaian Otters. However the deal did not proceed and the allotment was withdrawn by Department of Transport 30-Apr-1971. • G310 Continued in service until 1973, when withdrawn and put up for sale. • N17688 Joseph V. Masin, Rodenkirchen, West Germany. 26-Apr-1974 Allotment C-GLCT to DHC-3 msn 430 for Air-Craftsmen Ltd., Rothesay, NB. • C-GLCT Air-Craftsmen Ltd., Rothesay, NB., who completed ferry flight from Ghana to New Brunswick and on to Oshawa Jun-1974. 06-May-1974 Bill of Sale; Joseph Masin to Eclipse Consultants Ltd. N17688. Note: Unclear why no note of sale to Air Craftsmen Ltd.
21-May-1974 Provisional Certificate of Registration & Flight Permit For Importation Flight, Takoradi, Ghana to Ottawa, ON, issued to Eclipse Consultants Ltd., Oshawa, ON, valid to 21-Aug-1974. 09-Jul-1974 Certificate of Registration & Flight Permit for two check flights for Certificate of Airworthiness issued to Weston Aircraft Co Ltd., Oshawa, ON., valid to 09-Aug-1974. 11-Jul-1974 Application for Certificate of Registration by Eclipse Consultants Ltd., Oshawa, ON. • C-GLCT Eclipse Consultants Ltd., Oshawa, ON. Regd 11-Jul-1974. 12-Jul-1974 Bill of Sale; Eclipse Consultants Ltd., Oshawa to BC-Yukon Air Services Ltd.
15-Jul-1974 Certificate of Airworthiness issued. 17-Jul-1974 Certificate of Registration issued to Eclipse Consultants Ltd., Oshawa ON. 23-Jul-1974 Application for Certificate of Registration by BC-Yukon Air Services Ltd., Watson Lake YT. 24-Jul-1974 Temporary Certificate of Registration (Commercial) issued to BC-Yukon Air Services Ltd., Watson Lake YT, valid to 24-Aug-1974. 26-Jul-1974 Certificate of Registration issued to BC-Yukon Air Services Ltd.
• C-GLCT BC-Yukon Air Services Ltd. Regd 26-Apr-1974. 11-Dec-1976 Bill of Sale; BC-Yukon Air Services Ltd., to Bannock Aerospace Ltd., Toronto, ON. • C-GLCT Bannock Aerospace Ltd., Toronto, ON Regd Dec 1976. 09-Feb-1977 Application for Certificate of Registration by Patricia Air Transport Ltd., Sioux Lookout, ON. 16-Feb-1977 Certificate of Registration issued to Patricia Air Transport Ltd., on lease from Bannock Aerospace Ltd., Sioux Lookou,t ON. 21-Feb-1977 Lease Agreement; Bannock Aerospace Ltd.,to Patricia Air Transport Ltd. 21-Feb-1977-20-Feb-1978. Accident Pickle Lake, ON. 25-Aug-1977. Shortly after becoming airborne, the Otter struck trees and the shoreline. The pilot had not used all of the available take-off distance. Pilot A.W. Oglivie and two passengers uninjured, but the Otter was destroyed. • C-GLCT Cancelled from Canadian Civil Aircraft Register. 23-Aug-1978. Otter 430 was delivered to the Ghana Air Force on 25th July 1962 with serial G310. It was the eleventh of an order for twelve Otters, all of which were packed into crates and shipped to Ghana, where they were re-assembled and entered service. They were based at Takoradi Air Base. During 1970, Lambair of Manitoba negotiated with the Ghana Air Force with a view to purchasing a number of their Otters, including 430 and marks CF-ZFO were reserved but no deal was concluded and G310 remained in the service of the Ghana Air Force. The Otters continued in service until 1973, when they were withdrawn and put up for sale. As explained in relation to Otter number 418, eight of the Ghana Air Force Otters were acquired by brokers Masin Aircraft of Cologne and Otter 430 was registered to Joseph V. Masin of Rodenkirchen, West Germany as N17688. 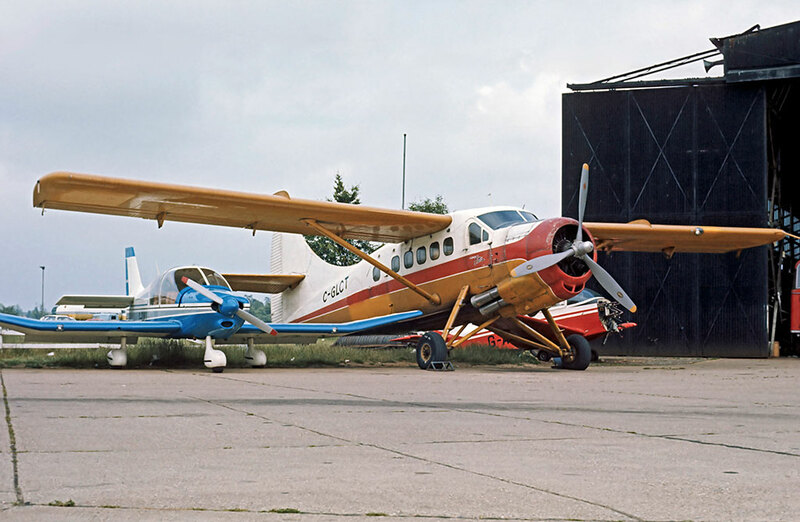 These eight Otters together with a former US Army Otter which Masin Aircraft had acquired, were sold to Air Craftsmen Ltd of St.John, New Brunswick, a company which specialised in buying, refurbishing and selling on ex-military Otters. On 26th April 1974 Air Craftsmen Ltd reserved Canadian marks for all nine Otters. Marks C-GLCT were reserved for 430. Together with C-GLCO (420, ex G304), C-GLCT routed from Gibraltar to Marseille on 15th June 1974, in the course of the long ferry flight from Ghana to Canada. On 17th June both Otters arrived at Biggin Hill airfield near London. Also arriving at Biggin Hill that day from Germany was Otter C-GLCV (189), the former US Army Otter which Air Craftsmen had bought from Masin Aircraft. All three Otters were fitted with ferry tanks for the trans-Atlantic crossing and departed together for Prestwick, Scotland on 21st June 1974. They then continued together across the Atlantic via Iceland and Greenland to the Air Craftsmen Ltd base at St.John, New Brunswick. C-GLCT then continued on from St.John to Oshawa, Ontario and was registered to Eclipse Consultants Ltd., of Oshawa, a company that was working in association with Air Craftsmen Ltd on the ex-Ghana Otters. At Oshawa, the Otter was overhauled and civilianised on behalf of Eclipse Consultants by Weston Aircraft Company Ltd. On completion of this work, by Bill of Sale dated 12th July 1974, the Otter was sold by Eclipse Consultants Ltd., to B.C.Yukon Air Services Ltd., of Watson Lake, Yukon and entered service with them. It continued in service until sold to Bannock Aerospace Ltd., of Toronto on 17th December 1976, another company which traded in Otters, and on 21st February 1977 it was leased to Patricia Air Transport Ltd., of Sioux Lookout, Ontario. 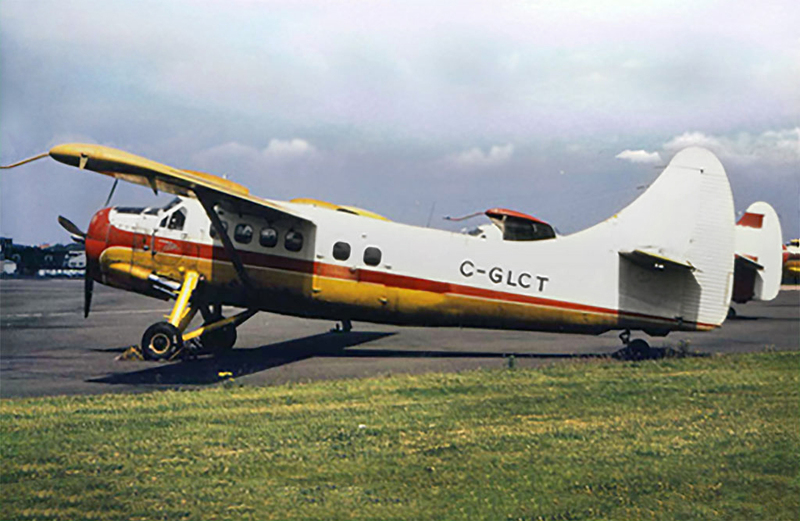 C-GLCT flew for Patricia Air Transport until an accident at Pickle Lake, Ontario on 25th August 1977. The Otter was to fly a round trip to Bearskin Lake, transporting cargo and passengers. The pilot elected to take on a full load of fuel because of strong headwinds and a limited refuelling capability en route. He did not compensate by off-loading cargo and the take-off was attempted 800 pounds overweight. Shortly after becoming airborne, the Otter struck trees and the shoreline. The pilot had not used all of the available take-off distance. There were no injuries to the three on board, but the Otter was destroyed.